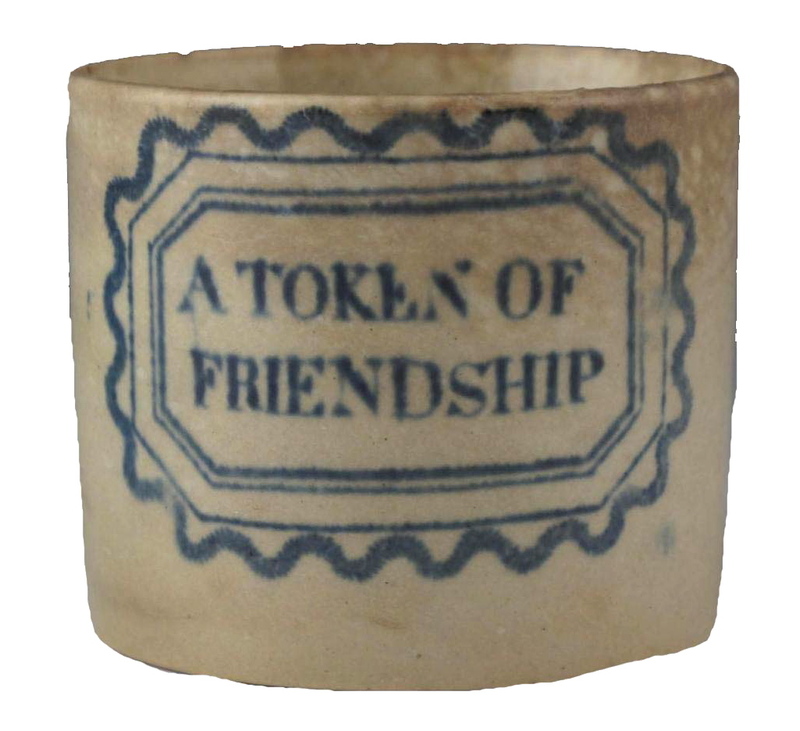 Black printed brick-shaped money box, 6.3 inches by 4.3 inches by 4.1 inches high. It is illustrated with five patterns designed for children; "The Pet Lamb" and "The Polka Dancer" are seen here. 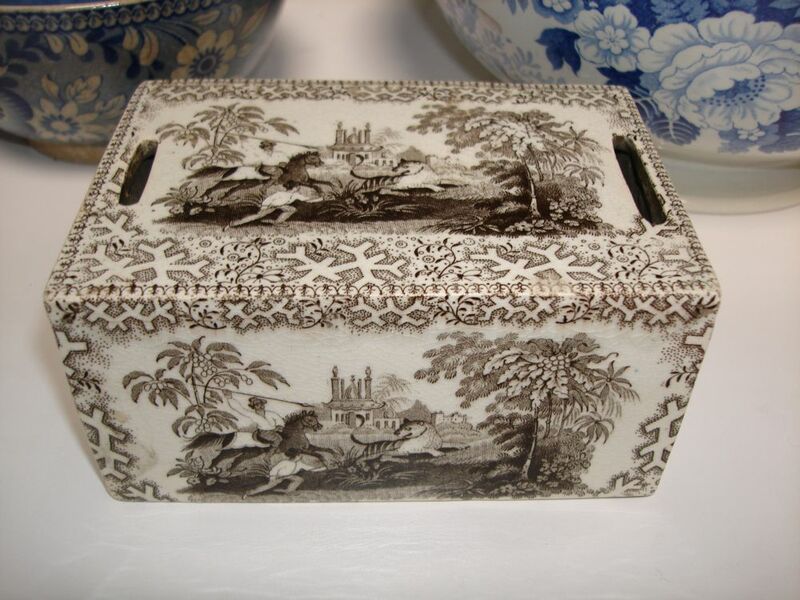 I have only seen two brick-shaped transferware money boxes. They were probably made for children, and didn't include a hole to remove the money. So, not many survived. One is owned by my friend, Dora. It is printed with five patterns that are also found on nursery plates. 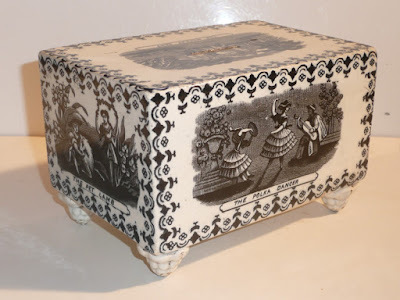 The other money box is owned by me. 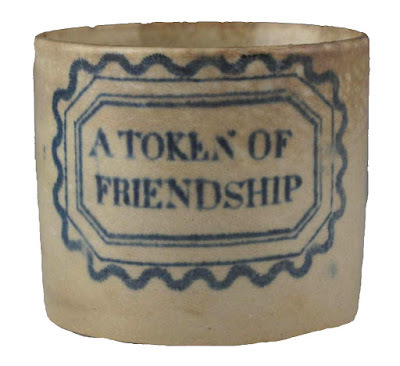 Notice the hole on the bottom of the money box. At least the whole box wasn't smashed to remove the money! Dora's box has four molded feet. You'll notice later that someone removed the feet from my money box. 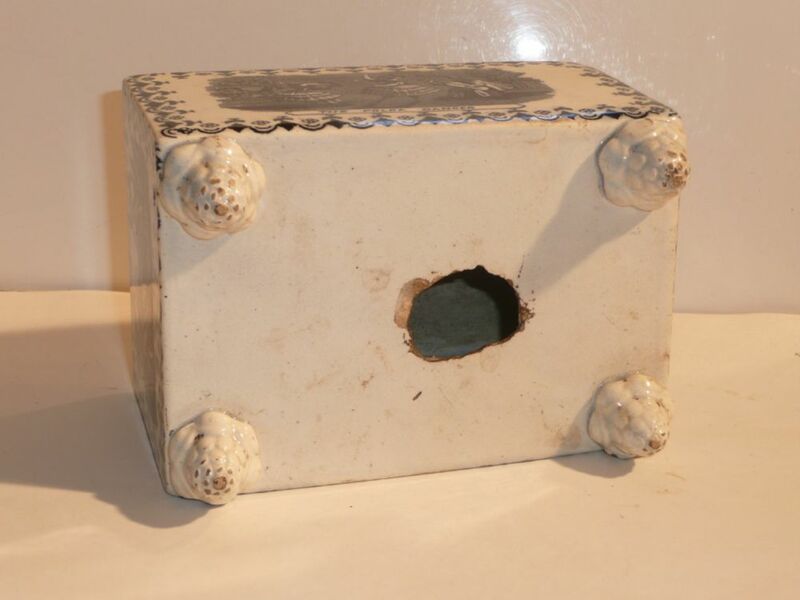 The money box has five different patterns. 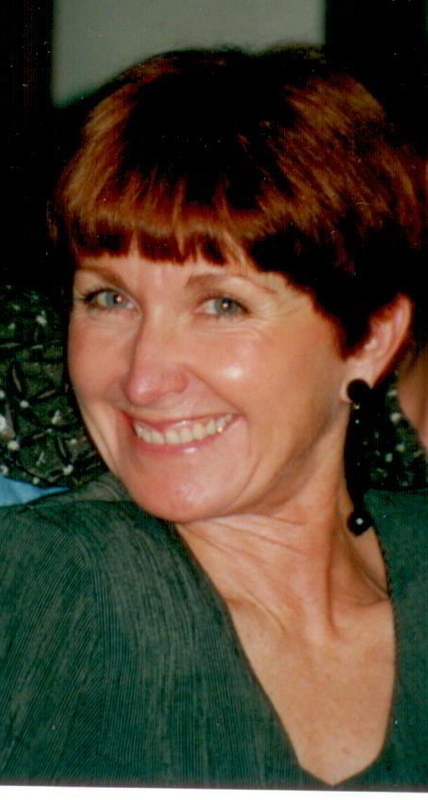 Here is "The Butterfly." 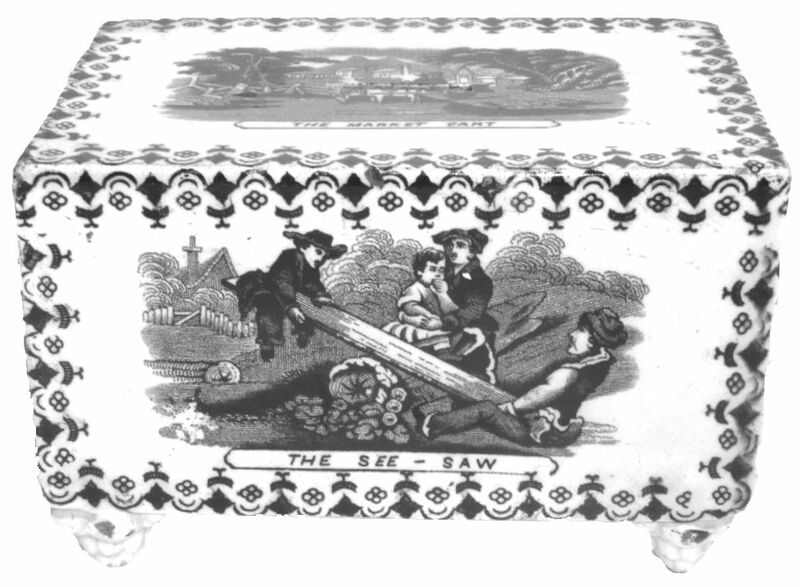 Below is "The See-Saw." The top of the money box shows "The Market Cart." Notice that this money box has only one slot for coins. Below is my money box. 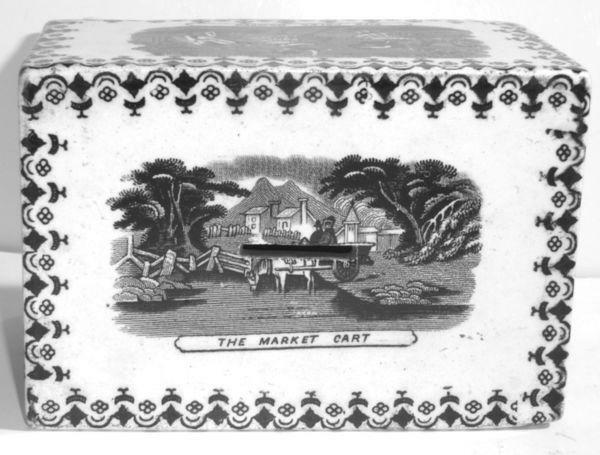 It has two slots, perhaps for coins of different sizes. 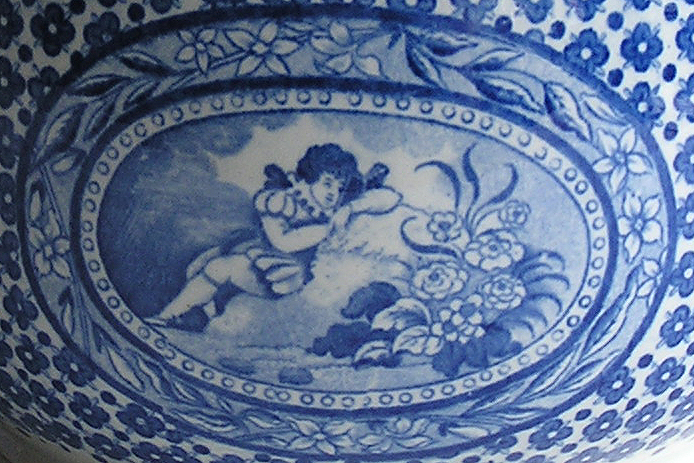 The pattern shows a romanticized tiger hunt. Any ideas as to the maker? Brown printed 5.25 inches by 3.5 inches by 2.5 inches high money box. Notice that this money box has two slots, perhaps for coins of different sizes. The pattern is the same on all sides. 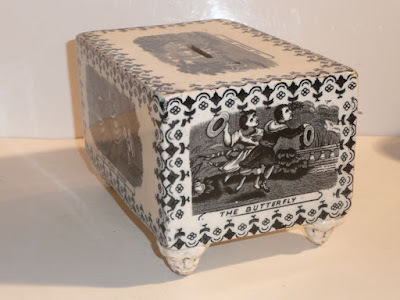 The bottom of my money box (seen above) shows that no one tried to remove any money, but someone removed the feet! 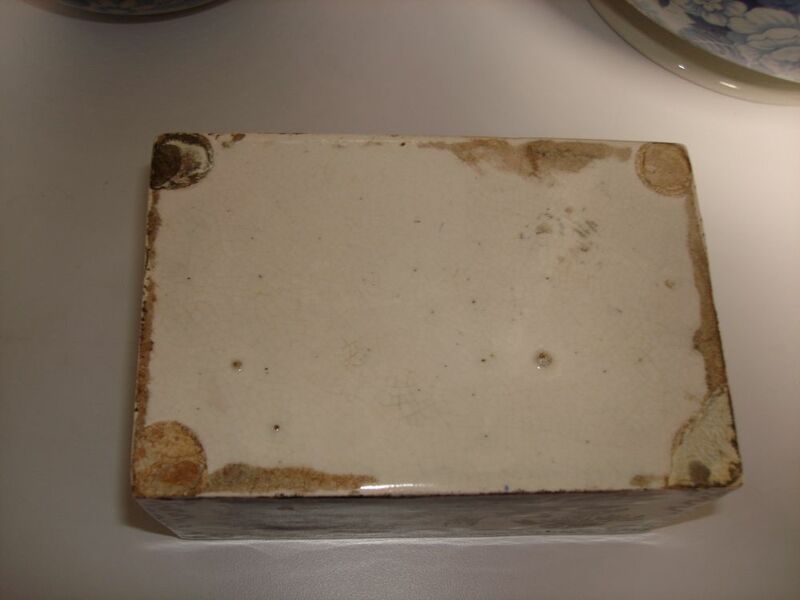 The box is attractive even without its feet. 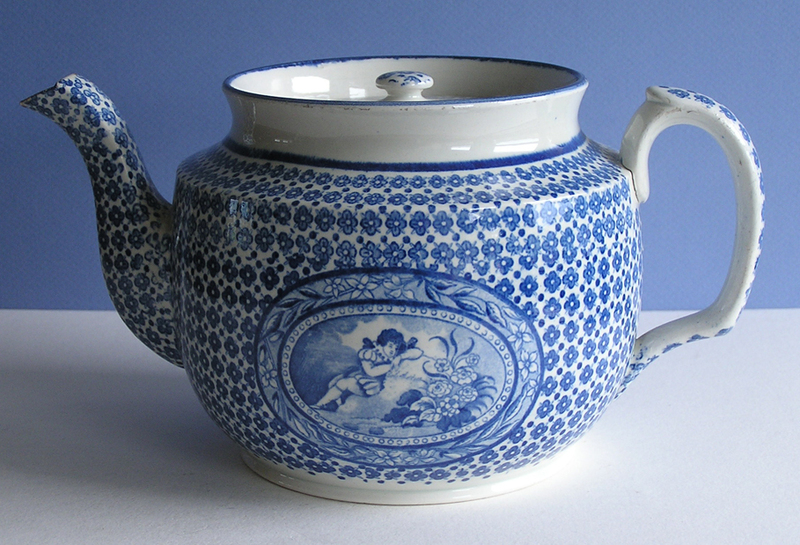 Early 19th century teapot with a center pattern depicting a child reading a book. It is known as "The Reader." I have been called that too. 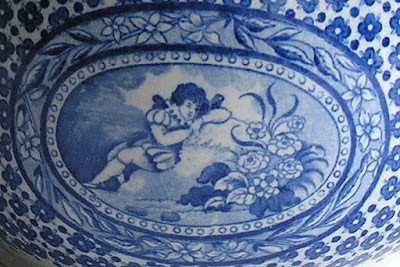 A close-up of the center pattern. 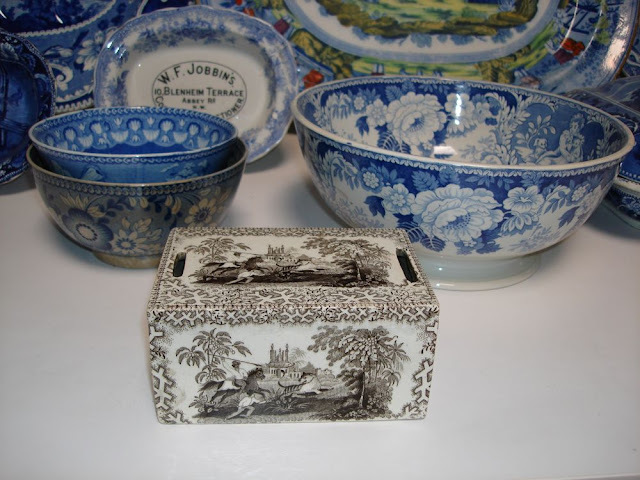 There aren't a lot of transferware patterns that show books and reading. 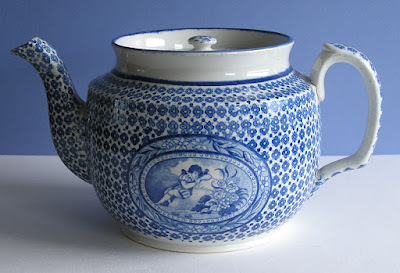 Most, as you may know, were used on mugs and plates that were gifts for children who were mastering the art of reading. I wish I owned one. 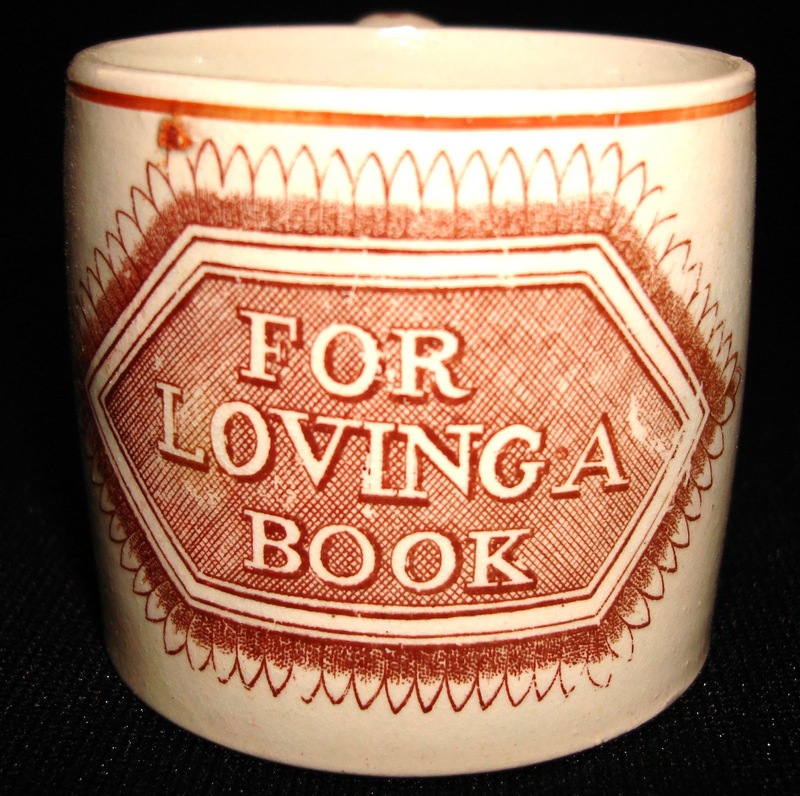 Child's 1.94 inch mug "For Loving A Book," ca. 1830. What a charming gift for a child who loves to read. Or anyone who loves to read. 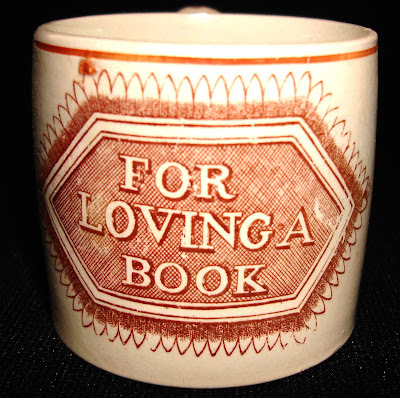 "For Loving A Book" child's 2.38 inch high mug, ca. 1830. One more thing. 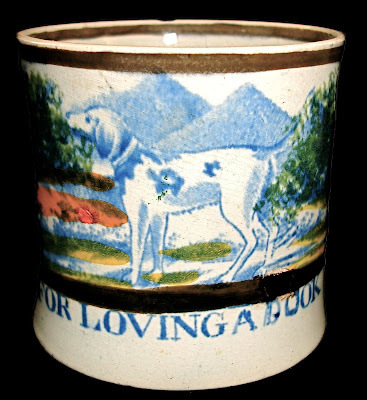 Pottery and books go well together. 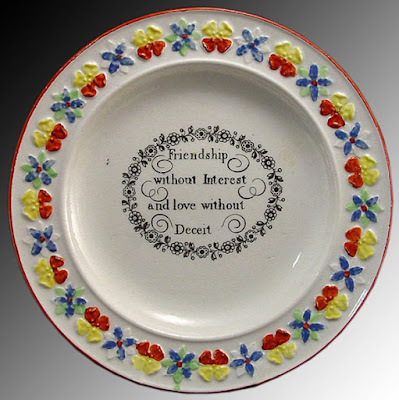 As you can see, pottery and books are cluttering up my shelves as much as eBook sites clutter up my in-box. Pottery and books go well together!